In the U.S., the youngest football players are more likely to return to play less than 24 hours after a concussion than their older peers, researchers found. In a study that assessed 1,429 concussions, kids on a youth team were six times more likely to be back in the game within a day than high school athletes (OR 6.23, 95% CI 1.02-37.98), Zachary Kerr, PhD, MPH, of the Datalys Center for Sports Injury Research and Prevention in Indianapolis, and colleagues reported online in JAMA Pediatrics. Compared with 0.8% of high school athletes and 4.7% of players at the college level, 10.1% of the youngest players who sustained a concussion were out playing on the football field the very next day, they reported. The odds of returning to the game 30 days or more after concussion were also higher in youth (OR 2.75, 95% CI 1.10-6.85) as well as high school athletes (OR 2.89, 95% CI 1.61-5.19) compared with those in college, the researchers said. "Youth football athletes may also struggle to identify symptoms and express how they feel to athletic trainers, which may result in misdiagnosis that is not corrected until symptoms persist," they wrote. "It is imperative to educate athletic trainers, parents, coaches, and officials on recognition and management of concussions in youth." This study was well-designed and executed and has significant power because of the high numbers of players interviewed, Barry Kosofsky, MD, PhD, chief of the division of pediatric neurology at New York Presbyterian Weill Cornell Medical Center, said in an interview. However, he added, these results beg the question of how many players went on to have a second concussion. "The youth coaches are putting kids back [in the game] sooner than the high school coaches," Kosofsky said. "I want to know whether second concussions were more common." When a player who sustains concussion returns to the field before full recovery, less force is required to produce a second set of symptoms that are more protracted, explained Kosofsky, who was not involved in the study. Kosofsky also pointed to results from a recently published study in former NFL players which showed that the earlier someone starts to play football, the more likely that cognitive and memory impairment is going to show up decades later. "We need to collect better information about repeat concussions," Kosofsky told MedPage Today. "There's no imaging or blood test used for diagnosis and that's why the natural history of this disorder is so difficult to understand. What we really want is more objective measures so that when comparing these three groups, we look at differences between the MRI results, vision and balance test results, and so on. Then we can develop best practices to see if the differences between the groups are indicative of better or worse outcomes 5 to 10 years from now." 3. The National Collegiate Athletic Association Injury Surveillance Program for college, which included 34 college football programs, providing 71 team seasons. Data analysis on the 2012 to 2014 season was conducted between July 2015 and September 2015. About 16% of concussions resulted in return-to-play at least 30 days after the injury, and 3.1% resulted in return-to-play less than 24 hours after injury. The most commonly reported symptoms were headache (94.3%), dizziness (75%), and difficulty concentrating (60.5%). Collegiate football athletes reported a higher mean number of cognitive symptoms compared with youth athletes, demonstrating differences in concussion symptoms between levels of competition, the researchers said. "Our findings suggest an association between level of competition and these outcomes and highlight the need for future research to continue exploring how the epidemiology of sports-related concussion varies across the lifespan," they wrote, noting that these differences could be due to genetic, biologic, or developmental differences, or variations in concussion-related policies, athlete training management, and athlete disclosure. The fact that very few concussions resulted in loss of consciousness demonstrates "the limited utility of that symptom in diagnosing concussion," Kerr and colleagues said. 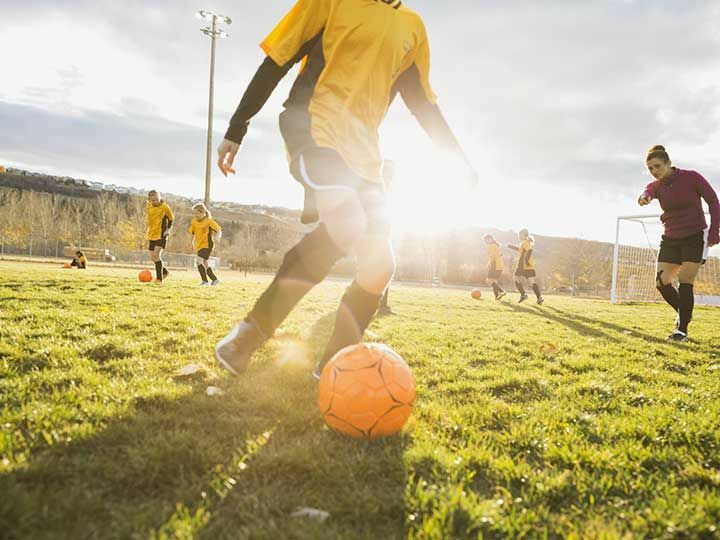 "These data provide the most common symptoms across levels of play, providing clinicians some guidance as to which symptoms should be minimally included in an assessment," they wrote. "Given that our study did not measure individual characteristics, as well as the many level-specific organizational, social-environmental, and policy-related factors, further research is warranted to validate our findings."